This is It. You Found a Product that Has Two of the Most Powerful Genuine Stones created by Nature, that Engages and Attracts Money Flow towards its Owner. 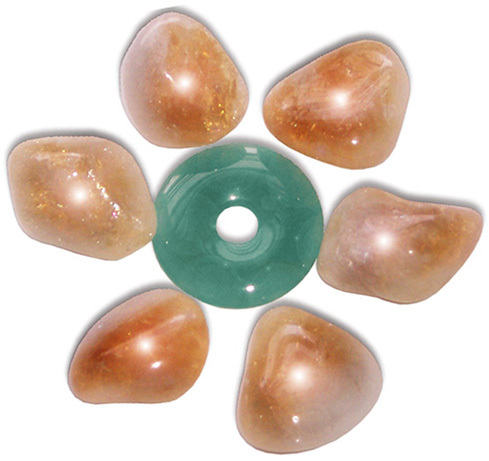 This MONEY Pouch Contains LUCKY MONEY DONUT in Genuine Green Aventurine Stone and Genuine CITRINE Tumbled Stones. The Lucky DONUT may be also used as a Pendant, if you choose to use it this way. And then keep the Citrine Stones in the Pouch with You. CITRINE is known as a MONEY STONE. As well it?s Called Success Stone and Merchant?s Stone of Wealth. Citrine is known as the "success stone" because it Promotes Success, Prosperity, and Abundance. It particularly promotes Success in Business and Money Involved Situations. Citrine is a stone of Good Fortune, and Sometimes brings it when you don?t expect it. It is a stone of manifestation, helping manifest abundance in many ways. Along with Prosperity and Good fortune, Citrine dissipates negative energies of all kinds. Since citrine eliminates negative energies, it helps generate stability in all areas of your Life, and is Extremely Good for General Protection. Citrine is a stone that brings Happiness and cheer to one who carries or wears it. Sensuality and sexuality can also be heightened by Citrine. It will Give Joy and Love to the owner. Citrine helps to manifest your goals and attracts abundance and personal power. The stone not only helps acquire wealth but maintain it, because it vibrates to prosperity in all its forms, as it is a Powerful MONEY Stone. Use this Pouch to Increase your Flow of Money and Success. Comes to you in Precious Satin Purple Pouch, Please see Picture Below for More Details. Suggested item: Sterling Silver Italian-Made chain.